Most pet owners already know that exposure to things like chocolate, bleach, and pesticide can be dangerous for our animal companions. But what about other lesser-known toxins? These common households items are probably already in your home, but you might not know that they could be harmful—or even deadly—to your beloved four-legged friend. 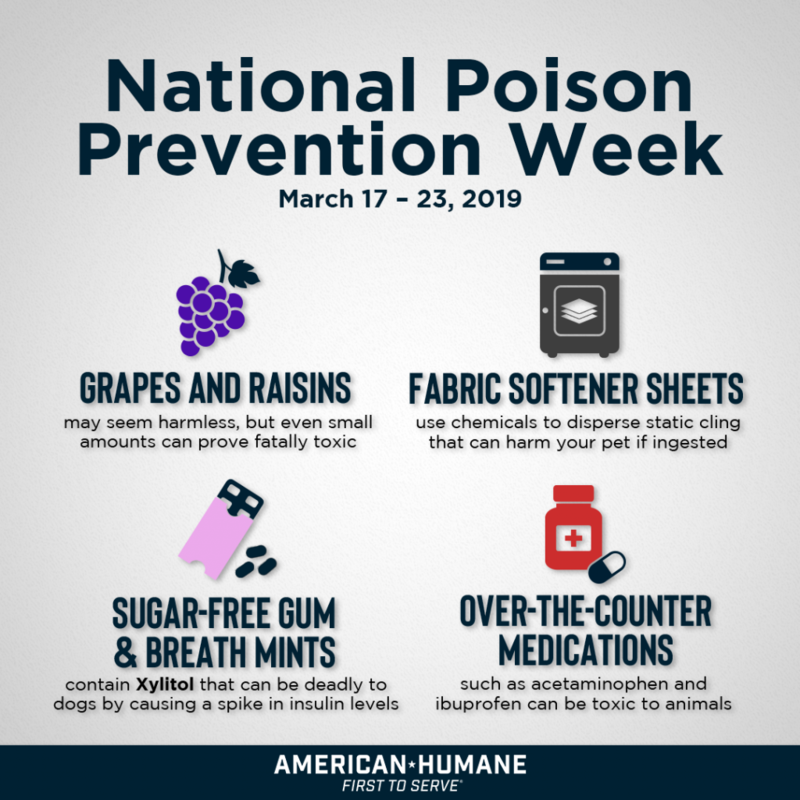 In observation of National Poison Prevention Week (the third week of March), American Humane is warning pet owners about these five surprising pet poisons hiding in plain sight. You could probably guess that human medications and pets are often a bad combination, but it might surprise pet owners to know that even common, over-the-counter pain relievers—such as acetaminophen and ibuprofen—can be toxic to animals. These pills often have sweet outer coatings that make them appealing to pets—think of an “M&M,” except a potentially deadly one. Even one or two pills can cause serious harm to a pet, such as kidney failure, so keep these medicines away from your four-legged friends! Dryer sheets help to disperse static cling by coating fabrics with chemicals. Unfortunately, these chemicals can harm your pet if they chew on or ingest a sheet, even a used one. Plus, the fragrant smell that we like so much in our laundry is also appealing to our furry friends, which means pets can be especially susceptible to poisoning from dryer sheets. Most common household batteries contain chemicals that pose serious health risks to animals if ingested. Even if your pet doesn’t swallow an entire battery whole, they can still puncture the battery casing allowing toxic fluid to leak out. Although it may seem harmless—or even humorous—when your dog chews on the remote or steals your kid’s favorite toy, but biting any battery-operated devices can be very dangerous. Sugar-free gum and breath mints often contain a substance called Xylitol that can be deadly to dogs. Dogs process Xylitol differently than humans: They absorb it quickly and it can spike their insulin levels, causing dangerously low blood sugar levels that can be life-threatening if left untreated. Xylitol can be found in common products such as toothpaste, candy, chewable vitamins, and mouthwash. This safety tip is something we all need to remember the next time you accidentally spill a packet of Tic Tacs in the backseat of your car, or your toddler squirts toothpaste on the bathroom floor. Grapes and their dried counterparts, raisins, may seem harmless, but not to dogs. Even small amounts of grapes or raisins can prove fatally toxic for a dog. If you know or suspect your pet may have ingested something poisonous, immediately contact the National Poison Control Help Line at 1-800-222-1222. Text “POISON” to 797979 to save the contact information for Poison Control in your smartphone. Finally, remember that it’s always better to be safe than sorry. If you have any reason at all to believe your pet might be poisoned, seek immediate veterinary assistance—the life of your animal companion could depend on it. “Every Day is Tag Day™” — Is Your Pet Protected?